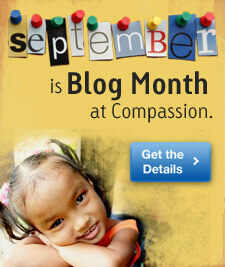 This is Part 1 of a Series in my final blog posts for our month long blogger campaign for Compassion International. This is one of the most difficult posts I have ever tried to write, but what follows is my heart and my words in a poetic voice, on the sights, sounds, and smells of poverty. Aligning my heart with a child in poverty. This is my voice as a child living in extreme poverty. Thank you for reading. Thank you for grace. The rumbles come in the night. They are funny like its talking. Like its saying good night but it lasts for a long long time. Like its saying hey, you forgot something. Hey you forgot to say good night with warm food. They talk to me every night. I named him, my tummy and tell him not to worry. And we’ll eat something and then you’ll stop your rumbling noise. I tell him not to rumble so loud, he might wake my sister. And I say sshhhh. You might wake up my mommy too. We’re nestled in a small small space. It’s love. It’s home. It’s cramped. It’s mine. And I tell my tummy to be brave and strong. Tomorrow we have much to do and much to learn at school. And I tell him to be brave and strong and at school he’ll rumble less. And in the night the crying comes. But I tell my eyes, be brave. I tell my tears, don’t roll. I tell my heart, be still. I tell my eyes, don’t cry. I give my eyes a name and I say don’t be sad, my eyes. Tomorrow we have much to learn at school. And I tell my eyes, be dry. Sshh, don’t cry. You might wake up mommy too. And in the night the dreaming comes. And I tell my dream, dream on. I tell my mind, keep dreaming. And I tell my heart keep dreaming, the hope-filled dream. And I tell my heart dream loud. And I named my dreams “Big”. And tell my dreams I will share you with my sister. I will share you with my mommy. I will share you with my classmates at school. And in the morning new mercy comes. And I say oh new mercies how you are welcome here. And I thank God, for His new mercies every day. I say Praise you God for your mercies and your love. I say I will worship you God for your mercy is great. And I name His mercies, I call them Jesus. And I tell God I will tell my sister. And I will tell my mommy of God’s mercy. And I will tell my classmates of the Savior. I will tell it loud and happy, strong and brave. I will tell it full of joy and hope and faith. But Jesus lives here too. And He is love and He is mine. Remember, God told us to become as little children. 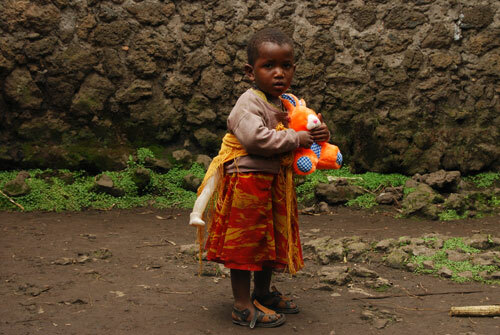 There is a link here to Compassion International if you’d like to learn more about child sponsorship. Wow! This is beautiful and heart-wrenching. So powerful. I ache for that little one and all the little ones who go through this. Thank you for linking this up today. Thank you Eileen for the hospitality at your place. Love being there in community. And your words to me, they mean so very much friend. Thanks for the tweet too. This is so very touching. Well done! Diane, thank you, friend. Your words mean so much. wow, is that little one carrying a little one? Makes me think of our own little girls we sponsor in Haiti. Oh wow, Elizabeth, that is GORGEOUS. I so admire your gift for poetry! I’m trying to figure out what to post on Friday. Compassion bloggers have so many different styles, and I’m in awe of all you poets! Humble thank you. You friend steward your gift beautifully. God uses each. Praying for child sponsors through words. Your girls in Haiti are blessed by your sponsorship. Praying for more child sponsors. Thanks for your encouraging spirit over here. Mindy, you bring joy to my soul. I pray the Lord will draw those to sponsorship whom He calls. these words drew me right into that tight drum of an empty stomach… aching and beautiful. Tara, your time spent here is gift. And your words? They too are beautiful gift to me. Elizabeth, thank you for your words and tender seeing, your compassion, your heart –this little one representing all the little ones. Thank you for this gift. May others come forth to answer dream calls in Jesus’ name. Oh the ache…my heart feels it, Elizabeth. And if I could, I’d support another just on your words alone. thank you! i could barely bear to read this for the ache. for knowing children experience this. i am sharing. thank you. seriously beautiful and powerful share….thank you. This is such a beautiful and well written post. Your words certainly created a picture in my mind. Congratulations on winning a gift for your child! What a blessing! Michelle, thank you. So glad to meet you through Compassion. Congrats again to you, friend. Thank you for visiting. Grateful for your visit and your kind words. 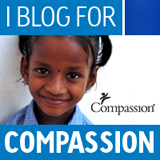 I just started blogging for Compassion. Congratulations on winning for this post–it is just beautiful. Keep sharing the love! Thank you for sharing. Just found your blog from the Compassion blog. I blogged for Sept too. This is so powerful.